This will probably look a little biased as I own one of these phones, I'll admit. If you don't know the N8, here's a quick summary. The design is really nice. It feels solid in your hand with its brushed aluminium, without seeming too bulky. The camera stands out a little (literally) which is sometimes in the way when you have the HDMI cable conected. You might end up touching the glass infront of the camera, but that's no biggie. A menu button adorns the bottom left corner of the N8, which is awkward to reach with your thumb when holding it. Could've been better in the middle, but I'm sure it has its reasons to be there. The contrast of the screen is brilliant, colors are vibrant and yet not too much "Pow, right in the face!". The clarity is good, easily readable in sunny conditions. The built-in GPS works well with the supplied OVI Maps. It may take a bit to find a signal though, if you disable assisted GPS and network based GPS. I disaled it because I'm not on a data plan. Yet. Now let's focus on what makes the N8 the N8. The pictures are astonishing, not just because of the 12 Mp but because of the camera sensor size. It's the biggest there is out there at 1/1.83″. You can see some of the amazing pictures it takes here at flickr and a top 5. Videos can be recorded up to 720p. The quality is great and the sound is surprisingly really clear and clean. I dare say it could easily rival that of any compact camera. Pictures, when saved, are about 1 to 2 Mb in size due to compression. There are a few mods out there that circumvent this and produce pictures with 8~12 Mb. The difference is quite big, but it takes a few seconds to save/process after taking one. Have a read at this, if interested about the modification. Once again, I'm very sure that it can outrun all compact cameras. You won't find a better camera on a mobile phone. 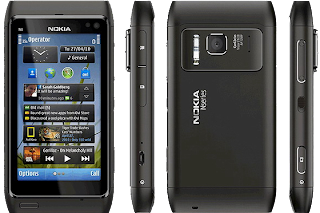 I would compare the new Symbian^3 to the older OSes, but I've never used any of them. There a few things that need fixing though. The browser is somewhat slow and unresponsive. Opening a folder with many non-system icons (a games folder, for instance) can take upto 5 seconds to open, though that happens only once, then they're loaded into the memory until you reboot or close the menu. These and many more bugs (+50, according to Nokia) are going to be eliminated with the new update PR 2.0, which is due maybe end of April. Bit depressing, seeing how long the N8 has been out. I guess they can't be blamed, what with them partnering up with Microsoft, though they did write in their twitter that S^3 will still be supported and upgraded. Yet it feels kinda old, the GUI. Maybe I'm too used to seeing Android's. A new GUI is to come with PR3.0. At the end of this year. If we're lucky. But even through all this, I can happily say that I love the N8. It does what I want and what I need. 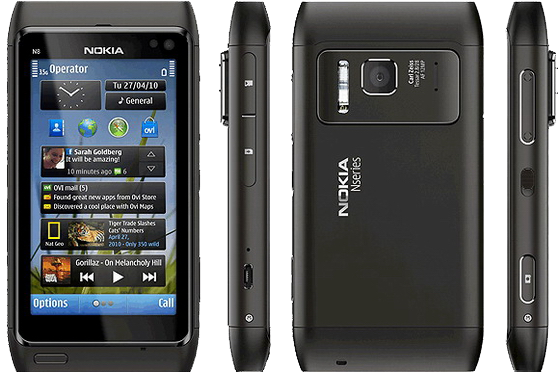 My father have a Nokia N( and its a grat phone. I't the touch witch isn't that good..
Whoa that's a good looking phone! It looks nice, but I still prefer my HTC EVO 4g! I really like the look of this phone! Nice Blog! Following and Supporting! I need a new phone. That just looks too cool. nice but i'm not really a nokia fan on smartphones..
Ugh I still don't even have a cell phone. Sounds good, but until I absolutely need to get a new phone I am keeping mine. However, I'll keep this one in mind. Seems like an awesome phone! Great review. The N8 looks really awesome and i really want to get it! Like the review - wish I'd bought something like this instead. ggod phone!! I want one!! good review, but iphone forever! Good review, I'm looking for a new phone and considering this. Now thats my kinda phone. Looks really great. I'm thinking about buying it, but i don't really have the money right now. haha, i have this phone. Nokia makes solid phones. Remember an older one, was near indestructible.